This is a very common and widespread jelly fungus. It obtains its nutrients by parasitizing wood-rotting crust fungi in the genus Peniophora. It occurs singly or in groups on logs, branches, and twigs of oaks and other hardwoods. The wood on which it is found may be fallen or still on the tree but is always dead and usually has the bark still attached. When young and fresh the fruiting body is one or more stemless, gelatinous but tough, ¾″ to 4″ wide, 1″ to 2″ in height lobes and folds. The lobes are translucent, shiny, and pale orangish-yellow to bright yellowish-orange. When clustered, they fuse together and resemble an exposed brain. They are mostly water. In wet conditions they swell and lose shape, looking like a dollop of melting butter. When they begin to dry they become darker orange, more opaque, and smaller. In dry conditions they become dark orange, shriveled up, hard, and brittle. Sometimes they collapse into an inconspicuous film when they dry, but will revive with the next wet weather. It is not poisonous but cooking it will release the water and leave little to eat. Brown Witches’ Butter (Tremella foliacea) forms a cluster of cinnamon brown to purplish brown, leaf-like lobes. Golden Ear (Tremella aurantia) lobes are thicker and have a dull, matte finish. They are not shiny. They do not shrivel when dried. Its host is Hairy Curtain Crust (Stereum hirsutum), a bracket fungus. Orange Jelly Fungus (Dacrymyces palmatus) is slightly smaller and more orange. It is white at the base where it attaches to the wood. It grows only on conifers. White Coral Jelly Fungus (Tremella reticulata) is white. Older specimens are clusters of finger-like branches. It tends to grow on the ground. 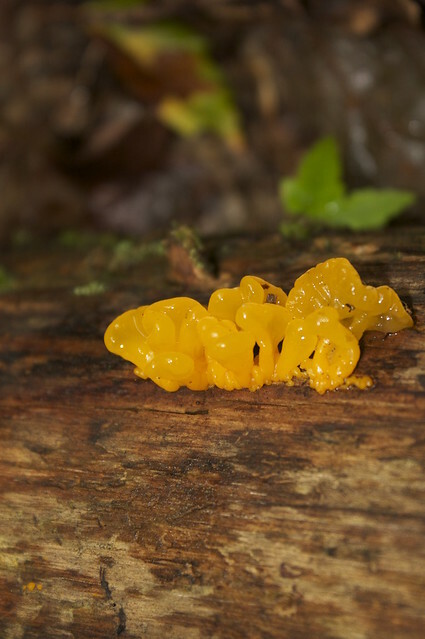 Tremella mesenterica - jelly-like fungus found on recently dead or decaying wood. Nu este comestibila. Se intalneste tot timpul anului pe ramurile cazute de foioase. Determina un putregai alb al ramurilor. Google Translate: It is not edible. It meets throughout the year on fallen deciduous branches. Determine a white rot of branches.